Several Sabhaologists have inquired about tips for giving a Vicharan presentation in sabha. "Most times, there is little to no material in the syllabus for this. As a presenter and even as a sabha sanchalak I find myself showing a video from baps.org of Swami's vicharan. Of course there's no story there, no context (except when it's an utsav and there is some topical tableau setup for Swamishri), and no words." So this week, let's break down Vicharan. The beauty of this method is that no syllabus is required. Think of the last time you saw some late-breaking news update and that sense of excitement and interest it generates. We want to drum up the same type of sentiment here and may as well be your shakeup start. We have late breaking news about Swamishri. 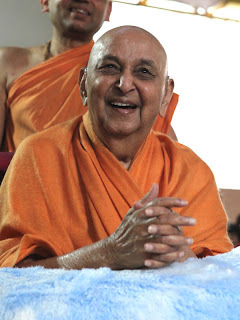 What is Swamishri doing right now? What happened last week with Swamishri? If you were traveling with Swamishri, what would you be experiencing? Indeed, it's a tough one as everyone knows what is about to happen, but there are still some things we can do. For example, two monks were returning to the monastery in the evening. It had rained and there were puddles of water on either sides of the road. At one plac,e a beautiful young woman was standing unable to walk across because of a puddle of water. The elder monk approached her, lifted her into his arms, carrier her to the other side of the road, and continued on his way to the monastery. Later in the evening, the younger monk inquired, "Sir, as monks, we cannot touch a woman ?" "But then Sir, how is that you lifted that woman on the roadside?" The elder monk smiled at him, "I left her on the other side of the road, but you are still carrying her. " This story is unexpected, now use this to relate to Swamishri. He exemplifies this vairagya. As the pictures are rolling on screen, we can emphasize this. Here is Swamishri in Mumbai Mandir, but he is detached from all the things around him. Gather prasangs from the website, including Bliss.We can even relate older prasangs that fit into what is happening now. We can clearly see that Bapa has just had his mundan done (shaving of hair and beard). "In Sarangpur on July 3rd, 1998, it was the night before mundan (monthly shave). To enable everyone to have darshan of Swamishri's mundan, a barber's chair, which was of adjustable height, had been brought. Swamishri was shown the chair. Meanwhile, Gnaneshwar Swami asked Swamishri, "When you were young, did the barber come to your house to give you a hair cut?" "Yes," replied Swamishri, "the barber had been contracted. In return for his services, he would get some grains. He would know when to come, so he came regularly ." Then, Shvetvaikunth Swami asked, "How did you part your hair - on the side or in the middle?" "On the side," Swamishri replied! Everyone smiled with joy on hearing Swamishri's innocent and honest reply." So while showing these pictures, we can say that in Mumbai, Swamishri just had his mundan done. In 1998, Swamishri had his mundan done in Sarangpur and something interesting happened; he revealed bits of childhood. Vicharan comes around once a month, so don't let this opportunity go to hone in on a unique style of presenting. It's not rocket science, and approaching it with the science of Sabhaology can help the audience samjan of Swamishri soar to new heights. Thanks for doing an entire post on my request! Here's something else I've started to do as a sabha sanchalak/presenter. To quote the syllabus, "The goal of these monthly sessions is to connect the kishores with Swamishri." I invite vadils, and yuvaks (I might even try a few balaks) to come and share their prasangs, and moments with Swamishri, and explain why that means a lot to them. The goal is to get the presenter to start thinking really deeply about their relationship with Swami. The result? Presentations with amazing genuine and personal feeling attached to it. The presenters really pour their soul out in these. And so, by having other people describe how they see Swami, the kishores are encouraged to develop a vision of their own towards Swami. This also brings different mandals in our mandir closer together. Give it a try. Just be selective on who you invite because that makes a big difference of course. If this idea materialize in a consistent way, it will be great help to all Sabha's including Vadil.